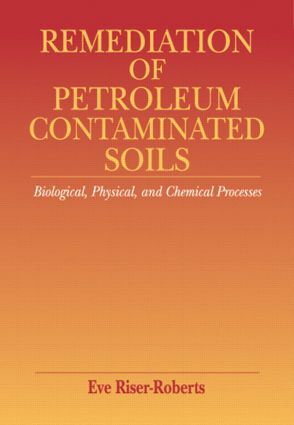 This book combines the results of current research with essential background material to provide complete, in-depth coverage of every aspect of in situ and ex situ bioremediation, as well as an extensive overview of the physical and chemical processes currently available for treating petroleum-contaminated soils. Critical information has been collected and assembled under one cover to provide a convenient reference for anyone who must contend with this worldwide problem. Remediation of Petroleum Contaminated Soils: Biological, Physical, and Chemical Processes describes how to optimize the biodegradation of petroleum hydrocarbons in soil-water systems. It reports on the susceptibility of various petroleum components to biodegradation by microorganisms, and considers all groups of microorganisms for their potential contributions. The book also deals with problem areas such as the transport of organisms, oxygen, or nutrients throughout the subsurface, as well as biodegradation of polynuclear aromatic hydrocarbons (PAHs) and nonaqueous phase liquids (NAPLs). In addition, the book presents a variety of methods for monitoring bioremediation. This reference discusses current soil remediation processes and includes many innovative approaches. It also investigates means of controlling volatile organic compounds (VOCs) and leachate, and addresses methods for collecting and treating these secondary waste streams. The expansive coverage of this book will furnish readers with a wide range of options for developing treatment strategies and for customizing procedures for specific requirements.